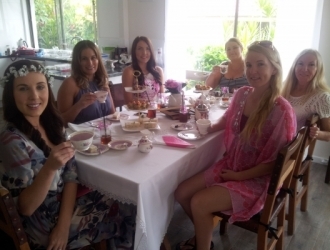 Hens Parties can be set up in your Holiday House at Byron Bay, Lennox Head or surrounds, in your home or on the beach. We are mobile and we come to you with everything you need for your Hens Party, except the tables and chairs. Food is all home cooked, and we deliver set up, serve and clean up. 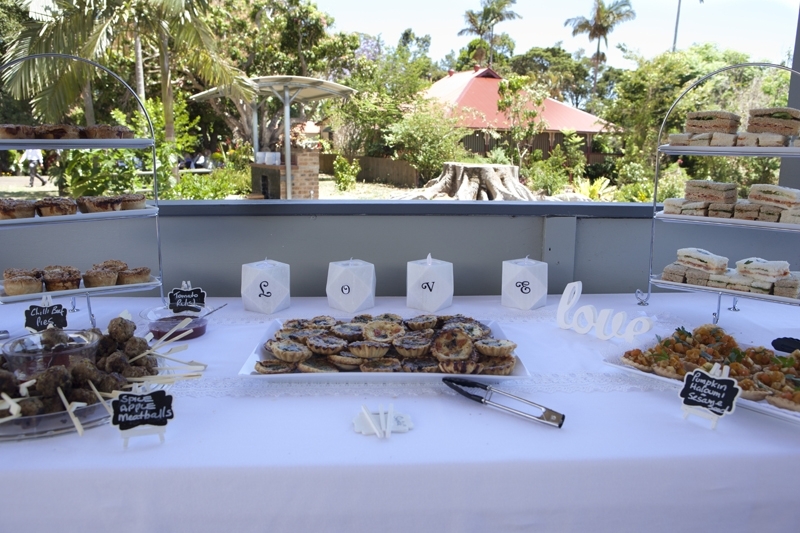 Whether you decide on a High Tea or a Picnic we do it all. 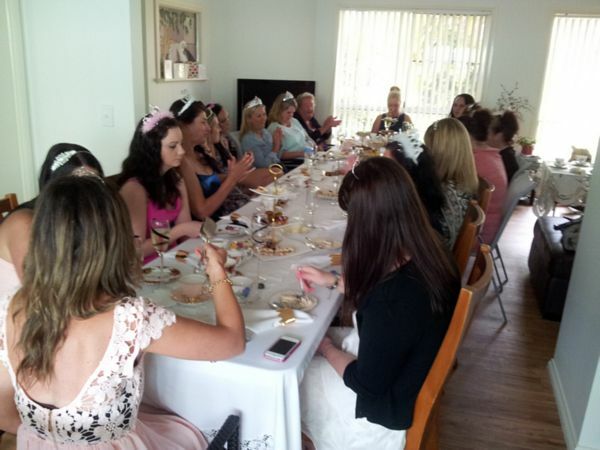 We will also work with Wicked Waiters to bring some fun to your Hens Party. Looking for a Wedding Ceremony Venue, that will wow your guests and keep your money in your pocket. Romance is created with our packages to deliver the wedding ceremony that you will remember and enjoy with your partner. You can change the package around to suit your requirements, and we are happy to accommodate. Our main venue is the Wyrallah Chapel but we do work with other venue such as the Old Clunes School. If you have a venue that you love, we can design a package to suit. 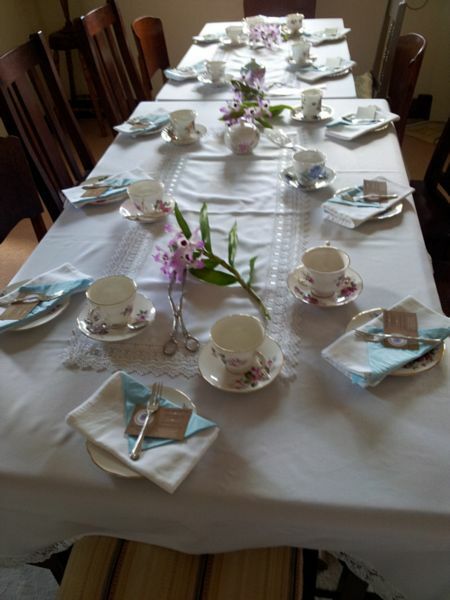 High Tea Ladies offer Wedding receptions in the Country Halls. 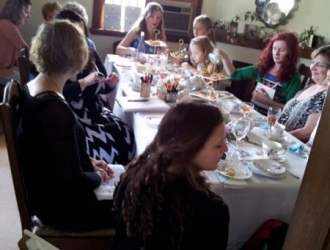 You can have a High Tea with all the trimmings or a picnic style set up with tables and chairs or low tables and cushions or a combination of both. The beauty of a country hall is the tables and chairs are supplied for your use and included in the hiring. 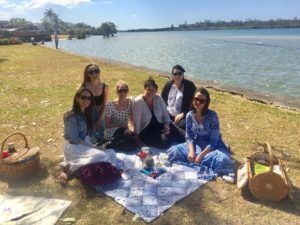 If you live or are visiting the Northern Rivers particularly around Lismore, Ballina, Byron Bay and anywhere in between and you would like to organise a celebration of some sort. 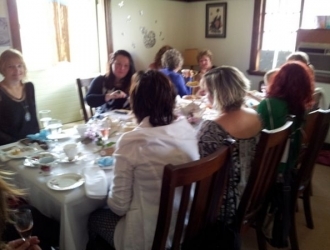 Whether it is a ‘Baby Shower’, ‘Hens Party’, a milestone birthday 50th, 60th, 70th, 80th, 90th or 100th. It could be a child’s birthday or even a ‘Wake’. Your work place may need to organise a Morning Tea or a luncheon to impress staff or clients, or you would like to do a fundraiser for a special cause. We can do it all for you, leaving you with nothing to worry about except invite the guests. 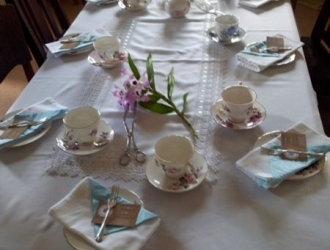 For High Teas we bring all the fine china, silverware, lace trimmed tablecloths and create a unique setting for you and your guests to enjoy. We can come to your home, holiday house, country hall or workplace. Picnics can be arranged for two guests such as a romantic picnic or for a group. We can deliver in the old fashion picnic baskets, or we can set up buffet style. We have a large picnic menu to choose your selections from. Great for any occasion including weddings. Picnic style can be set up inside a hall with table and chairs, or with low tables rugs and cushions or can be set up outside in a country setting. Wake catering is another one of our specialties, and we are always honored to be requested to cater for a wake to celebrate the life of a loved one. We deliver and set up in your own home or hall. 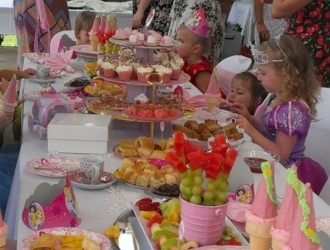 ‘Childrens Princess Parties for all ages can be also arranged. We can cater for the little ones up to the teens. 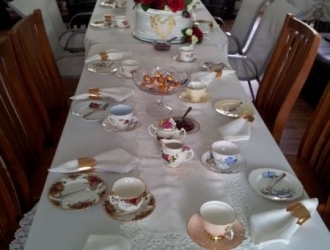 Decor is included in our packages, and we can set up a High Tea with the fine china, or a High Tea Picnic style, or even a Teddy Bears Picnic. Romantic Picnics are such a great way to wow your Valentine. Our Picnic Baskets can be ordered ready for you to take to your special location, or you can have a surprise picnic set up by us, and all you need to do is arrive and enjoy the romance. So why not order now so you do not miss out. $100 for Cheese Platter, Picnic Blanket, Picnic Basket with china crockery, small teapot, and your food selections. Menu is suitable for a meal. Mobile Catering with a difference. The food is gourmet, presented in a unique way. 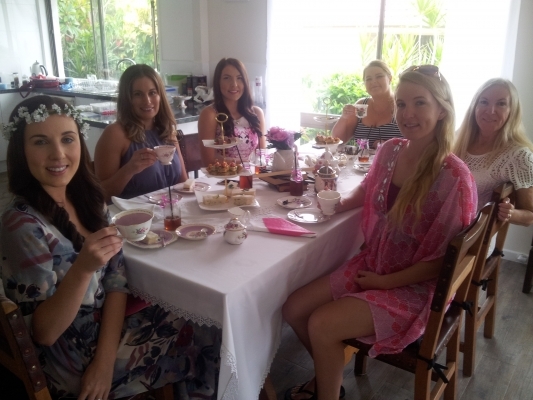 We do High Teas, High Tea Picnics, Group Picnics, Romantic Picnics, Children’s Theme Picnics _ you name it we can do it. Mobile Wake Catering – Sandwiches, Savouries and sweets. We deliver, set up and Clean up for you. 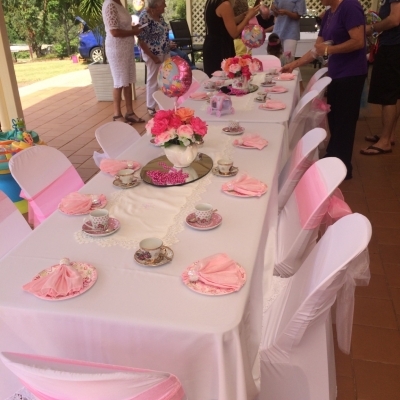 Baby Showers :- All packages or catering includes decor to suit. 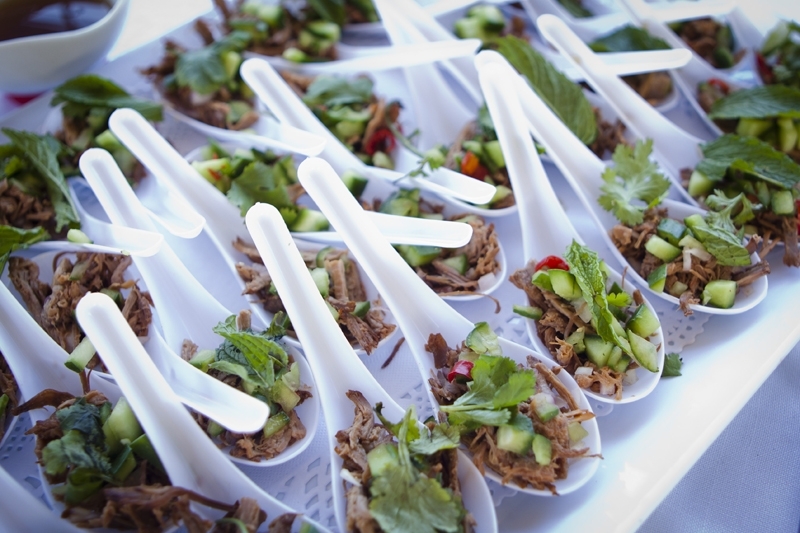 Can be a High Tea, a Picnic Style, or just catering. Hens Parties:- If you are holidaying in a holiday house at Byron Bay, Ballina, Ocean Shores or anywhere in between. We will deliver, set up and clean up. Birthday’s, Weddings, engagments we do it all. Corporate Morning Teas or Lunch:- Why not impress your staff or VIP guests. 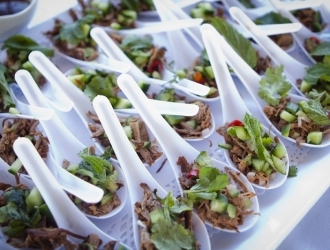 We will design a catering menu to suit your requirements. Fundraising:- Let us help you raise some serious funds. We do great deals to assist. 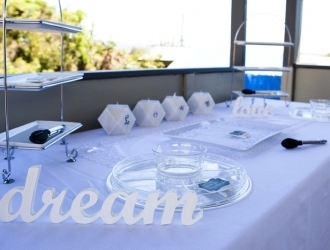 Proposal Set ups – Let us impress your loved one with a great set up to wow him or her. If you are on holidays in the Northern Rivers Region, especially around Byron Bay, Lismore, Ballina region, and you would like to have a picnic either for a couple or for a group, let us help you. 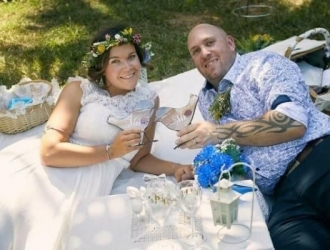 Romantic picnics are set up in old fashion picnic baskets, with china, silverware, gourmet food suitable for lunch or dinner, hot water flasks, teapots, cheese platter, wine or champagne glasses. You receive a picnic blanket and two cushions as well. If it is a special occasion we will even set up a beautiful setting at a location of your choice , as a surprise for your partner. This is a optional extra which includes extra decor to match the occasion. A low table for you both to sit at. 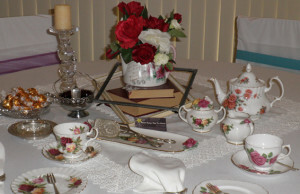 Picnics for two $75 – Picnic basket, 3 course meal, tea, coffee, teapot, china, hot water flasks. Group picnics can be set up with old fashion picnic baskets outside with picnic blankets or inside if you wish. 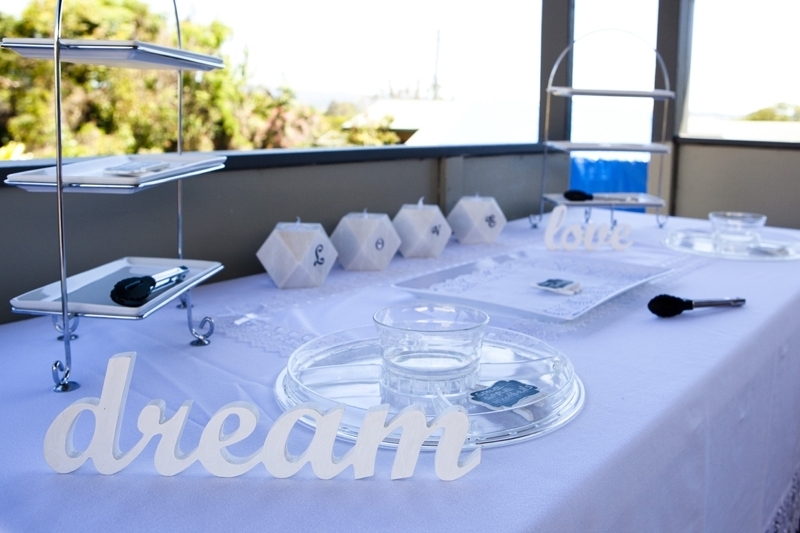 Over 30 we would do buffet style, and each guest would have a little picnic box to select there menu and return to the table or picnic blanket to enjoy. No matter what the occasion we can design a picnic to suit. Children’s picnics, Baby Showers, Hens Parties, Birthday, Engagements, Weddings. 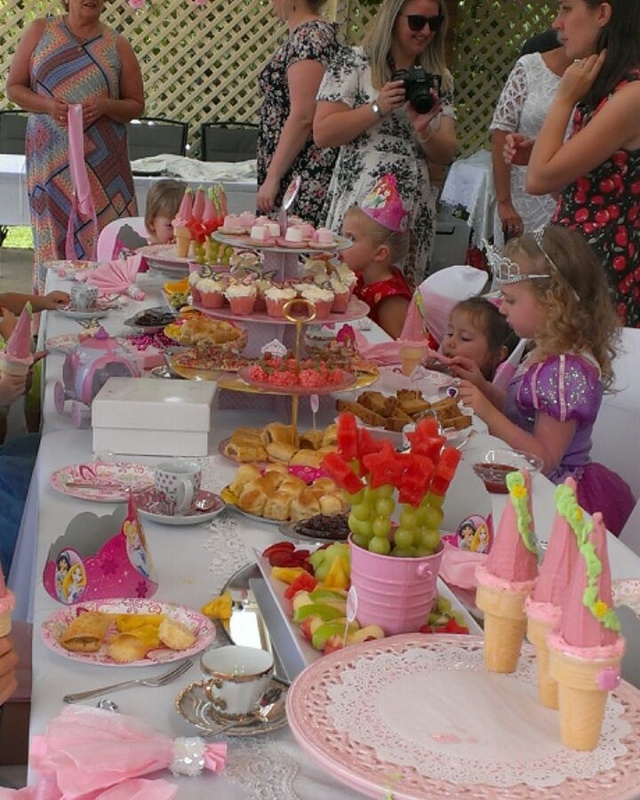 Our latest children’s party is a Fairy and Unicorn High Tea Picnic. 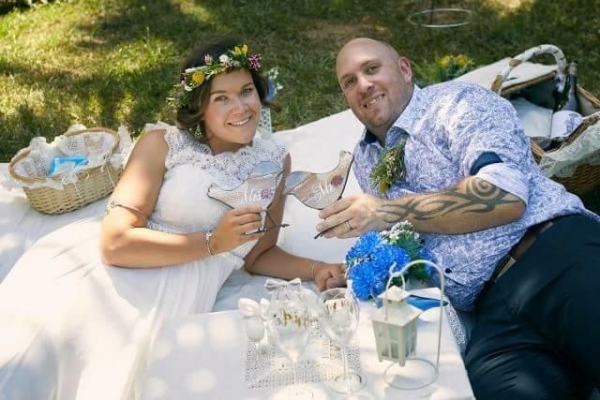 Food is all themed to suit, and there is beautiful decor set up so as the children are given the impression that they are sitting in a fairy garden. Picnic baskets are decorated with flowers, picnic blankets laid out. Children’s Tea and Pink Lemonade to quench the thirst of the little fairies. What a wonderful way for your little one to enjoy her special day. 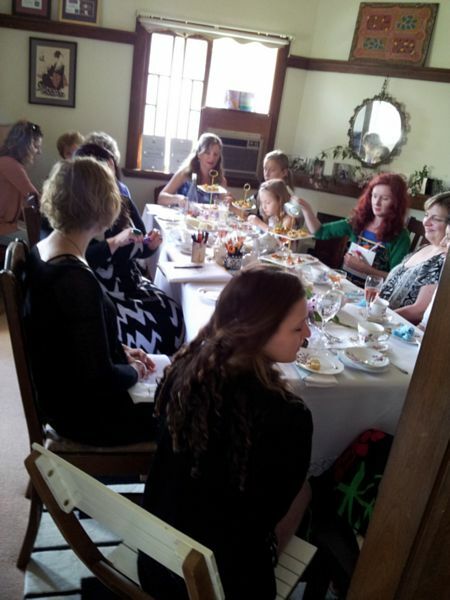 High Tea Parties are a great way to celebrate any occasion. Whether it is a Baby Shower, Hens Party, Birthday, Ladies Get Together, Fundraiser or Family Reunion. The best thing of all High Tea Ladies supply table decor with their High Tea to suit the occasion. So if it is a Baby Shower for instance, both the food and the decor will match a Baby Shower. For instance we will do Deviled Eggs in the shape of a pram with a baby in it, or cupcakes iced like a baby’s face. Serviettes are colour coded to match your preference, so there is no stress. 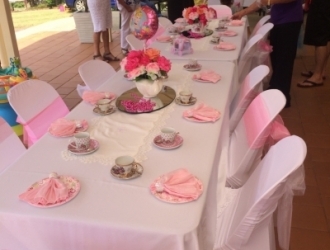 We bring everything for your High Tea, we set up, we serve the food, and we clean up. So why not check out our packages and have a high tea. 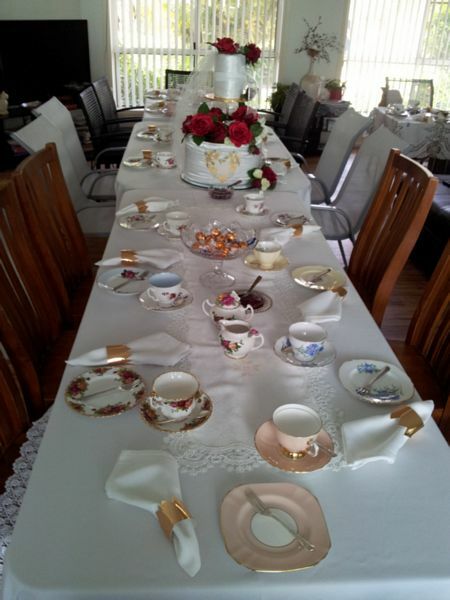 We can do up to 100 guests with our high Tea Packages, over 100 the china is not so fine. 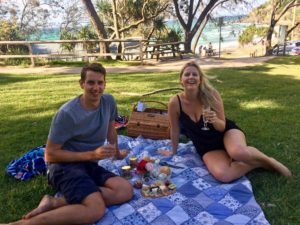 Picnic’s – Romantic picnic for couples are available, supplied in an old fashion picnic basket and we can deliver to Byron Bay or set up a proposal picnic with decor if you would like to surprise your partner. We have china in our picnic baskets, small teapots, tea and coffee, cheese platters and champagne or wine glasses. All you need to do is purchase the champagne or wine. Group Picnic’s :- Great for Family Reunions, Corporate company picnics, Wedding Receptions or any event. 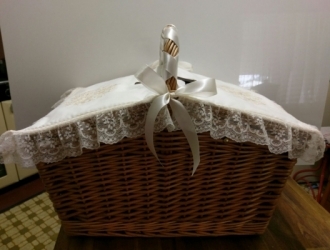 We can cater for up to 30 odd with old fashion picnic baskets, over that we would set up the picnic buffet style. 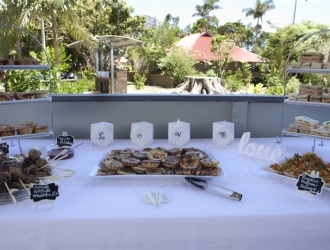 Each guest receives a small picnic box to go to the buffet and select their food and then return to the seating to enjoy. Picnic’s can be set up inside a hall, or outside. Can also be set up with tables and chairs or picnic rugs or pallets with cushions.